Have I told you how much I love DIYs? Well, I certainly do! I am always eager to learn new techniques and ways to make your own masterpiece. I am especially interested in upcycling. There’s nothing better than changing trash into treasure! I am sure you all have some sort of cookie tins or random empty containers laying around in your house. Even if not, I still hope you can be inspired by this post and start on the journey of DIYs. This upcycle is really simple. 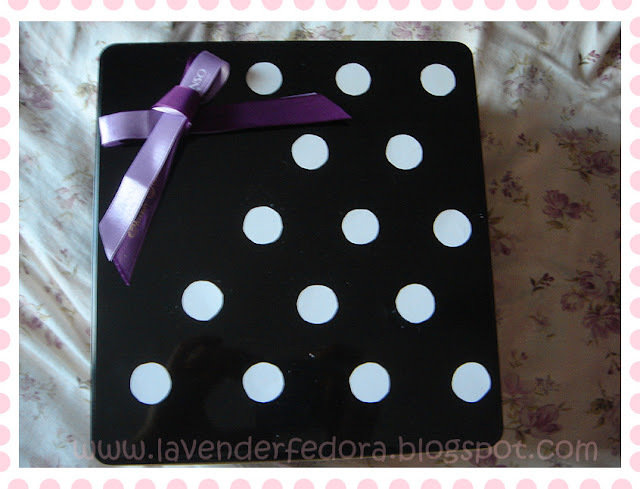 All you need is an empty container that you wish to revamp, paper (any color of your choice, preferably thick ones), some decorative pieces such as nicely-designed papers, rhinestones, ribbons etc. Let’s get started! First, make sure your container is nicely cleaned. You can pour some robbing alcohol onto a cotton pad and give your container a nice bath. Then, let your creative mind take over and do whatever you want with it really. I cut out circles of equal size out of scrap paper, and arrange them arrange them diagonally. Since they are just paper, you can use whatever glue you want. I believe I just used some double-sided tape. 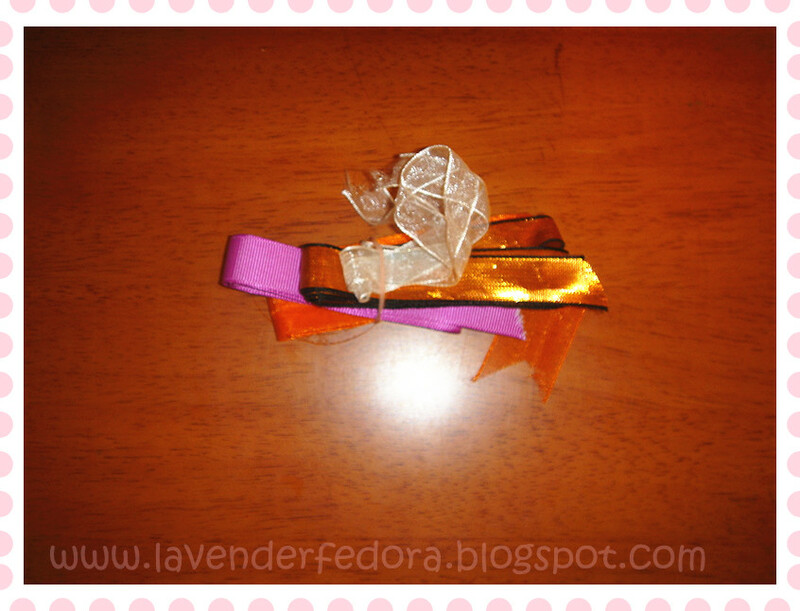 Combining two different ribbons, I made a pretty bow out of them. By the way, I have an obsession with ribbons. I have been collecting them from gift wraps, cakes packaging ever since I was in kindergarten LOL There’s nothing cuter than polka dots and bows, in my opinion. I am pretty picky with my design, so I was not satisfied with this upcycle yet. Since I had some textured wallpaper left from a huge makeover that I gave my bedroom the previous summer, I put that all over the inside of the container. Many of you might find this unnecessary, but I like to beautify things inside and out. 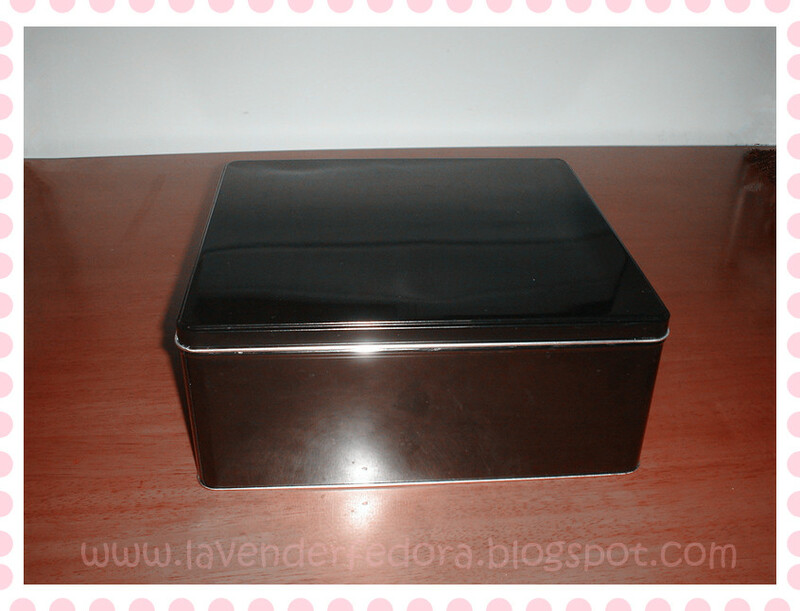 I really think the lining adds a interesting touch to the box and voila, your very own cute container is completed. There are so many things you can do with this tin. 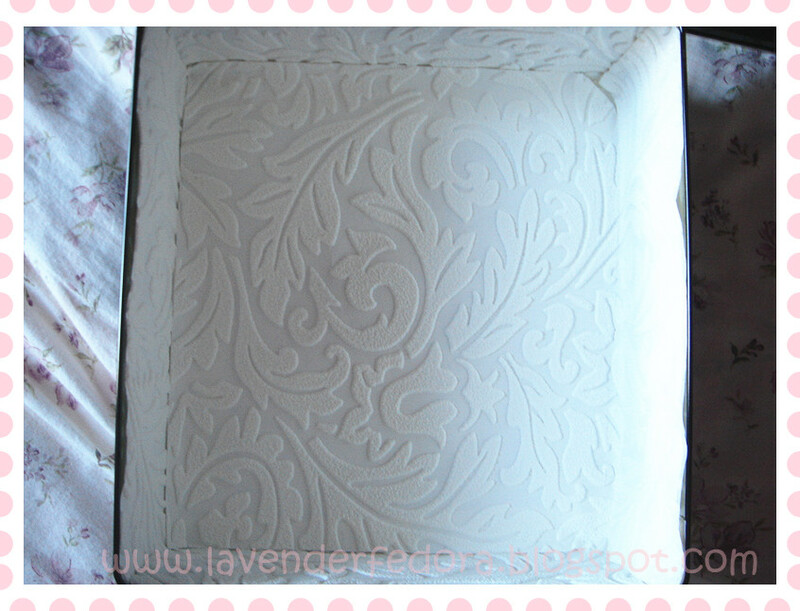 You can simply design it to fit your own room decor so it would be a nice touch to your room. 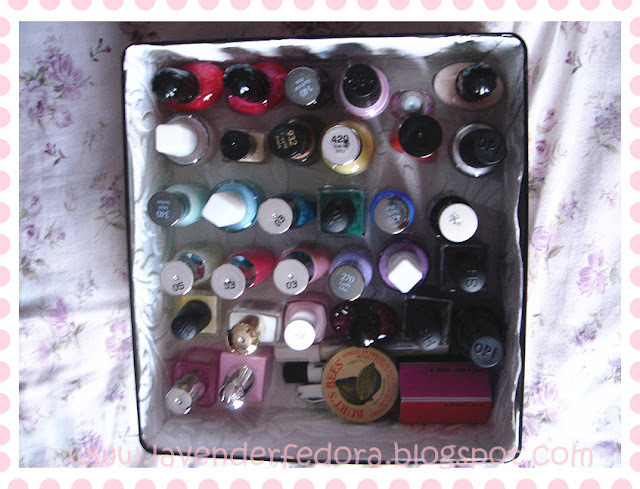 Or like me, you have way too many nails polishes or makeup items that you need to store, go ahead and put them in here. The possibilities are endless and I hope you enjoy this short and simple DIY. OOOO I love what you did with the box! Now it's so super cute! 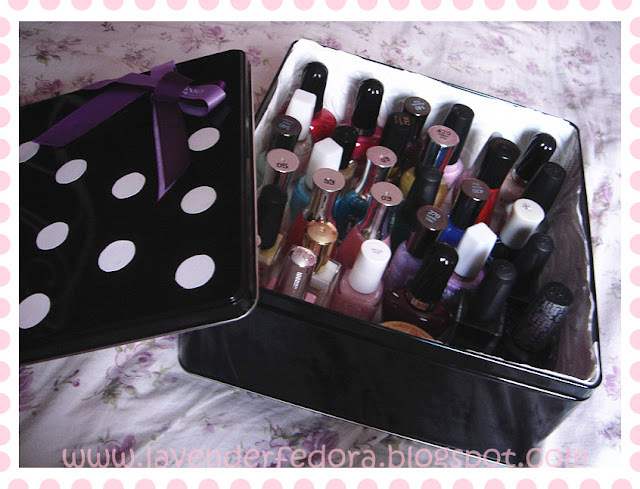 I'm not a good DIYer at all (too clumsy and impatient), but I'll definitely keep the idea in mind! My name is Katherine and I write a blog entitled Hot Child in Chi City (www.hotchildinchicity.blogspot.com). It's a lifestyle blog you've recently commented on, and I write about fashion, style, beauty, home decor, travel, and restaurant/bar reviews. I recently came across your blog and I think it's fantastic, which is why I chose to nominate it for the "Liebster Award." You can find info about the award on my blog. I'm not sure if you are familiar with it (I wasn't until a few days ago) but I've gathered that it is just a nice way for bloggers to interact and recognize one another. I hope you'll check it out! Thanks for writing such a great blog! Hope you had a great weekend! Hi Katherine :) Aww you are so sweet. I never heard of this award before but I'm gonna check it out! It's such an honor to be nominated by you<3 Let's keep in touch! This is so pretty and I love DIY's too! Have a happy Monday! So clever; I always leave my nail polish laying around on a (pretty silver) tray but it tends to get quite dusty. This is a great alternative! hehe :) Thanks! It saves room and it adds a nice touch to your overall design, doesn't it?